This weekend, escape to Yercaud, a serene hill station, situated only 650 kms away from Chennai and unwind at INDeco’s Lake Forest Resort which is set on a coffee plantation on the banks of the Yercaud Lake. 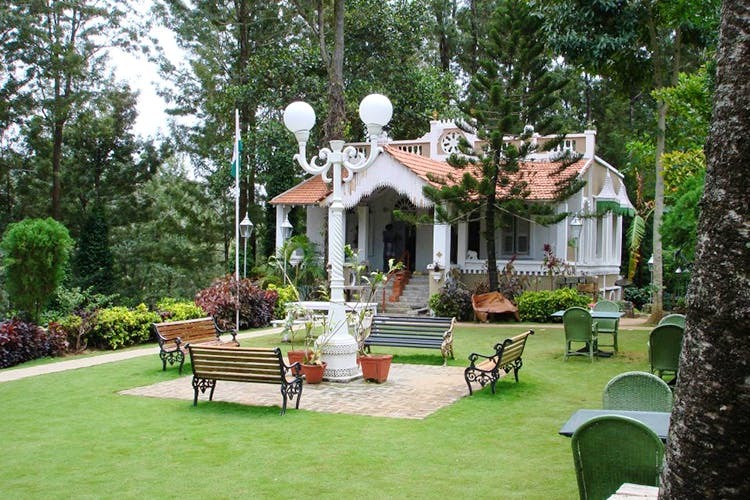 INDeco’s Lake Forest Hotel is set in the Eastlynne Farm Estate amidst a coffee plantation on the banks of the Yercaud Lake. It was first developed by Henrietta Charlotte Rosario during the 1800s. The resort has now been carefully restored to get a feel of a bygone era which is evident given the regal Anglo-Indian style of architecture that was prevalent in the late 1800s. The resort consists of 75 luxury suites and also has royal and family suites. The most unique suites are the Eastlynne Garden and The Henrietta Chamber which are hidden away in a coffee estate. All suites follow the theme of English Royalty and the rooms have been named after Queen Elizabeth, Lady Diana, Lord Clive, Charlie Chaplin, and Lord Elihu Yale. The interiors also reciprocate the Anglo-Indian style of Henrietta. What’s best is that they practice the concept of restore, reuse and recycle (they do not use any fresh wood in construction). So there’s happy forests all around!